Eyes that are blood shot are very irritating. Knowing the causes and treatments can keep you ahead of the condition, avoiding further inconvenience. Bloodshot eyes are a common problem and usually not serious. They usually occur as a result of eye strain or irritation, or when a person is not getting enough sleep. Eyes develop redness in response to an internal or external occurrence. When something irritates the eyes, they can develop a pinkish hue, be laced with red lines, or the whites can become completely red. Eyes might also appear red because of a broken blood vessel, inflammation in the lids, or because of colored lenses. In some instances, blood shot eyes are an indication of a medical condition, so if a problem with red eyes persists or eyes become blood shot following a potential eye injury, it is a good idea to schedule an appointment with an optometrist. If this condition occur in conjunction with pain, discharge, itching, swelling, or vision changes, it could also be an indication of a serious problem. There are several types of drops intended to reduce redness in the eyes. These drops shrink the blood vessels located on the surface of the eyes, which gives the whites of the eyes a brighter appearance. Unfortunately, these drops can trigger irritation if used for an extended period. Long-term use causes eyes to develop resistance to shrinkage and more applications are needed to achieve the same effect. This condition is known as rebound hyperemia. The use of contact lenses is one of the most common causes of bloodshot eyes. Wearing lenses for too long or wearing lenses that are not properly maintained causes a build-up of microbes in the eye. If you wear contacts and develop congestive eyes, it could indicate an infection. Remove your contacts immediately and contact your optometrist. If you suffer from dry eyes, contact lenses can make the problem worse. Contacts prevent oxygen from reaching the cornea, restricting tear flow and causing eyes to dry. To minimize your risk for problems, wear only clean contacts that are properly fitted. Replace your contacts when necessary and consider wearing disposable lenses, which allow you to dispose of lenses before problems develop. Staring at a computer screen for extended periods of time can make eyes bloodshot, especially for new computer users. Computer vision syndrome is caused by a reduction in blinking when staring at the screen. It is possible to avoid problems by taking breaks, using lubricating drops, and wearing glasses specifically designed to be used when looking at the computer screen. Allergies can trigger redness because the immune system is reacting to foreign invaders, such as dust or pollen. Some people experience a reaction similar to this when swimming when their eyes are exposed to the chlorine used in swimming pools. Another common cause is illness or injury. Eye injuries trigger an inflammatory response in the eye by diverting blood to the area to speed healing. This can cause blood vessels to burst or just appear more prominent. Injuries vary in severity, but it is always a good idea to visit the doctor to ensure serious damage was not done during an injury. Illness is another cause. As a matter of fact, one of the most common causes of bloodshot eyes is "pink eye" or conjunctivitis. This is a highly contagious infection that affects the thin membrane covering the sclera and lining the eyelid. Other infections or illnesses that can cause it include a corneal ulcer, ocular herpes, and uveitis. A person can also develop blood shot eyes in response to a cold or the flu. Eyes that are blood shot can also be caused by a serious vision health disorder known as glaucoma. Symptoms of glaucoma include halos around lights, nausea, and painful, bright red eyes. Untreated, glaucoma can result in blindness, so it is very important to schedule an eye examination if any of these symptoms develop. Sometimes eyes become bloodshot in reaction to a condition unrelated to vision health. For instance, hormonal changesduring pregnancy can cause redness to develop in the eyes. Some women even find they are unable to wear contact lenses during pregnancy. Drinking excessive amounts of alcohol can cause bloodshot eyes because the amount of oxygen to red blood cells causes them to clump. 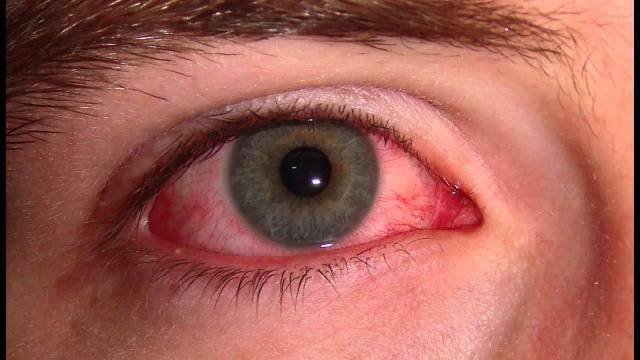 Finally, smoking cigarettesor marijuana can trigger red eyes. Tobacco is a toxic eye irritant that dries eyes and can cause permanent damage. The THC found in marijuana dilates blood vessels in the eyes, which can lead to temporary redness after smoking. There are several things you can do if your eyes become bloodshot and you know the cause is not a serious problem. Avoid rubbing your eyes and stop exposure to any irritants. If you find your eyes are bloodshot because of too much computer usage, schedule breaks every 20 minutes and gaze at an object 20 feet away for at least 20 seconds. This is called the 20-20-20 rule and it is widely recommended by optometrist. If it persist and the cause is not serious or you must wait to visit the optometrist, you can ease the problem with cool compresses on the eyes. Also be sure you are getting plenty of rest. Aside from lack of sleep being one of the primary causes, sleeping can also ease problems caused by other factors. If you wear contacts, take a break and use eyeglasses for a few days until the problem clears up. You might eventually need a new prescription for contact lenses or your doctor might recommend using a different type of lenses. In cases when bloodshot eyes are caused by a serious problem, your eye doctor might recommend oral medication, prescription eye drops, or even surgery.